“Each unit is solar-powered,” said Scott Hedgepeth, the environmental services manager for the city. “The garbage units are equipped with compactors to provide greater capacity, and each unit — both garbage and recycling — is equipped with a sensor that relays data on remaining capacity levels. “Data, such as current levels, number of compactions, how often units are emptied — as well as date and time — are stored in each unit and available for view by our staff through the Bigbelly app,” Hedgepeth said. Officials have received positive feedback as the new cans popped up along Nash Street. “First impressions are extremely important to visitors whether they are shoppers, tourists or potential residents or developers,” said Susan Kellum, downtown marketing and communications coordinator. “The new complementary systems of trash disposal and recycling show a sense of pride in the community along with a commitment to smart systems and innovation vital to attracting next generations. 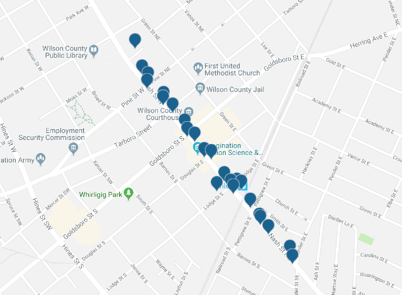 For local citizens, it reinforces the commitment that the city of Wilson and Wilson Downtown Development have made to the ongoing revitalization of the center city,” Kellum said. Prior to the installation of 24 garbage and 22 recycling units last week, downtown had 57 garbage cans with no options for recycling. “The first project was the downtown area and more specifically the downtown service district created late last year,” Hedgepeth said. “Within this area were the metal green trash receptacles; it was time for those units to be replaced or refurbished. Coupled with that, environmental services was looking to streamline operations, become more efficient and better serve the city as a whole, but more specifically the downtown service district as well as introduce recycling to the downtown area. “Bigbelly became an option to meet all those needs: allowing one employee to track the garbage and recycling as well; empty cans based upon need rather than checking three to four times per week and using three employees in the process,” he said. The department already had allocated funds to replace the metal cans, but additional money for the smart technology was freed by some operational changes that improved efficiency within environmental services. Hedgepeth said the department also plans to apply for a recycling grant. The old trash cans that can be salvaged will be used in areas throughout the city where Bigbelly cans are not feasible. In addition to the Bigbelly cans downtown, crews recently installed the containers at Lake Wilson Park where the new 1,000-foot pedestrian bridge has caused an uptick in park use.